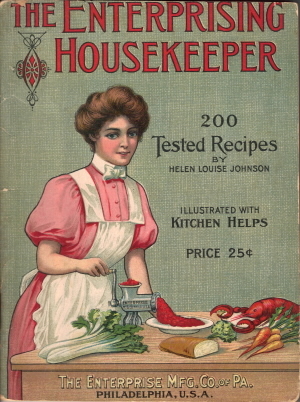 Here is page 64 from the antique booklet The Enterprising Housekeeper from the sixth edition (1906). The illustration represents the Combination Fruit Press in operation. Its principle is very simple; it is easily operated and saves rehandling, as it extracts the juice and ejects the skins and seeds in one operation. 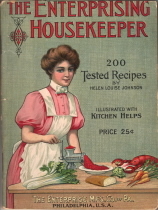 It may be used for many purposes, such as making wines, jellies and fruit butters from grapes, strawberries, raspberries, blackberries, gooseberries, currants, quinces, pineapples, etc. The dryness of pulp or refuse may be regulated by means of the thumb screw at the outlet. When ready to use, loosen the brass adjusting screws at the end (left) of the cylinder, so that the opening is free. 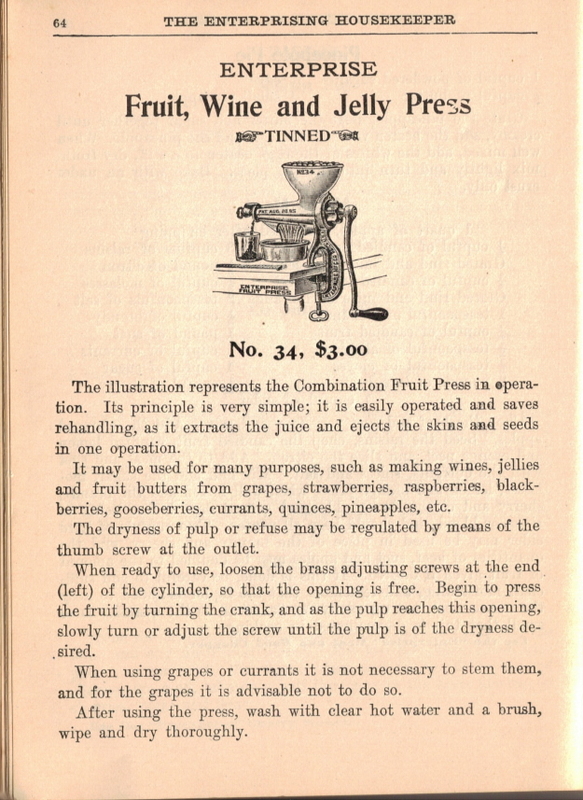 Begin to press the fruit by turning the crank, and as the pulp reaches this opening, slowly turn or adjust the screw until the pulp is of the dryness desired. When using grapes or currants it is not necessary to stem them, and for the grapes it is advisable not to do so. After using the press, wash with clear hot water and a brush, wipe and dry thoroughly.